Resolution: 0.1RPM at 2.5-999.9RPM, 1RPM at 1000-99,999RPM. Display: 5-digit 18mm(0.7") LCD Display. 3 Reflective Tape. Model: DT-2234C . If you do not receive our reply within 48 hours, pls. If you are satisfied with our service, pls. Description: This Digital tachometer is a high quality instrument to measure the Rotational Speed (RPM) with wide measuring range and high resolution. It's featured with high accuracy measurement, quick measuring time and long detecting distance up to 500 mm (20" inches) with Laser. 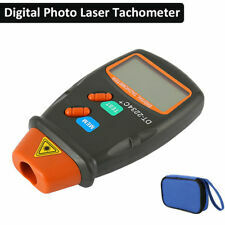 This Digital tachometer is very easy to use by applying a reflective mark (included in package) on target object, then aim at the mark by Laser beam. This tachometer has wide range of applications including measuring rotating speed of machine, motors, model cars, wheels, lathe for metal or wood cutting work etc. Features: Large LCD displaying Screen Wide measuring range & high resolution. The use o... . Range Selection: Auto range. With auto range, low battery indication and other functions. 1 User Manual(English). 3 Reflective Tape. Resolution: 0.1RPM at 2.5-999.9RPM, 1RPM at 1000-99,999RPM. Display: 5-digit 18mm(0.7") LCD Display. Range Selection: Auto range. Wide used in the field of motor, wheels, lathe, electrical fan, paper making, plastic industry, washing machines, car making, etc. Refresh rate: about 4Hz. 5000 rpm or less: about 2 rpm. 5000 rpm or more: about 3 rpm. Display color: red / blue / green / yellow. Red: Power 7-30 v. Green line: Signal input pin. Black line: negative. Screen: LCD Display. Waterproof: Yes. Size: 54mm x 36.5mm x 14.5mm/2.13" x 1.44" x 0.57" (Approx.). Due to the light and screen setting difference, the item's color may be slightly different from the pictures. Hall proximity model: NJK-5002C. Reset or manual reset on power. Proximity output current: 20mA(For the sensor). 1 x NPN hall proximity sensor. Detected objects: Magnet. 1 x magnet. Clear zero: Automatic. Inductive design: You just need to tie the cable to the for spark plugs. Accuracy: 1 minute or 10 RPM, Quartz. Show engine rpm and record hours of operation. Works on all spark ignition engines by selecting engine type using S1 and S2 buttons. 0.1 RPM (2.5 ~ 999.9 RPM). 1 RPM (over 1,000 RPM). Digital display gives exact RPM with on guessing or errors. The RPM of motors and machine parts. Testing Range: 2.5 ~ 99,999 RPM (rate / min). Large LCD displaying. Testo 460 Rotate Speed Measuring Instrument Tester Digital RPM Tachometer!!! It features a convenient max/min function and is ideal for use with ventilatorsand shafts. Resolution 0.1 rpm (100 to 999.9 rpm). 1 rpm (1000 to 29.999 rpm). Probe type RPM. They are easy and safety what you need is only a credit card. Power Requirement: DC 8-15V Measure Range: 5-9999RPM Clear Zero: Automatic Clear Zero Time: About 10s.the greater the RPM value, the longer the clear zero time Refresh Frequency: 0.2-0.5S@120-1200RPM; 0.25-0.06S@2400-9999RPM Measure Indication: RPM<5000, ±2; RPM>5000, ±3 Display: RED 0.56 inch LED Sign: Pulse signal, Hall NPN 3 wires normally open Hall Proximity Model: NJK-5002C Appearance: M12mm cylinder Detection Range: 10mm Proximity Output Current: 200mA Detected Objects: Magnet Response Frequency: 100HZ Tachometer Dimension: 72 X 36 X 20mm Panel Cutout Dimension: 68 X 33mm Sensor Dimension: M12x10x55mm Sensor Wiring: Brown-Power ; blue-Power-; black-signal Operating Temperature: 0 to 50°C Package Contents: 1 X Tachometer 1 X Hall NPN Proximity Sensor. Resolución: 0,1 rpm, de 2,5 a 999,9 rpm; 1 RPM, en 1000 a 99999 rpm. 2.5 99999 rpm. Los productos defectuosos deben ser devueltos dentro de los 30 días de la fecha en que realizó su pedido. Términos de venta. Resolution: 0.1RPM (10~9999.9RPM), 1RPM (10000RPM or more). Support auto ranging, auto power off, data hold, overrange display, low battery indication and other functions. Counting Range: 0~99999. Model: UT373. Resolution: 0.1 RPM at 2.5-999.9RPM / 1 RPM at 1000 - 99,999 RPM. -Mine Handheld Gun Type Design. Color:Blue Black. Detail Image. -Low Batter Indication. -Auto & Manual Power Off. -Data Hold Function. Resolution: 0.1RPM at 2.5-999.9RPM, 1RPM at 1000-99,999RPM. Display: 5-digit 18mm(0.7") LCD Display. 3 Reflective Tape. Model: DT-2234C . Working Temperature: 0 ℃ ~ 50 ℃ (32 ℉ ~ 122 ℉ ). If you do not receive our reply within 48 hours, pls. Laser: 2.5 ~ 99,999 r / min. Test Range Select: Automation. 1 Reflective tape 350mm. 1 Carrying Case. 0.1 r / min (0.5 ~ 999.9 r / min). 1 Operation Manual. 1 Main Unit. 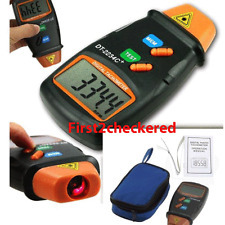 Features: 1.Every product has a unique Manufacturing Part Number label on the inner package that proves it has been qualified,which include Part Number,Model Number and inspection date information; 2.If you have any questions about the item,please provide us the Manufacturing Part Number for checking,your profits will be guaranteed. 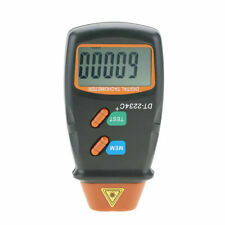 3.The tachometer is small,cost-effective.it fit 10-9999 RPM speed motor. 4.Input pulse signal: NPN/PNP open collector,contact switch,contactless switch,level pulse;Input signal voltage: low level: -30V -0.6 V, high level: 4-30V. 5.Accumulative counter,adopts low power integrated circuit,high bright LED Display with clear appearance. 6.Use:motor,fan,motor and other shafts..
Model: AR925. Ergonomic size fits in your hand perfectly to get a better grip. Sampling Frequency: 0.8Sec. ropes etc. Back-light makes you easy to read and accurate in low light areas or night. Material: plastic. Features: 1.Every product has a unique Manufacturing Part Number label on the inner package that proves it has been qualified,which include Part Number,Model Number and inspection date information; 2.If you have any questions about the item,please provide us the Manufacturing Part Number for checking,your profits will be guaranteed. 3.The counter meter is small,cost-effective.it fit 10-9999 RPM speed motor. 4.Input pulse signal: NPN/PNP open collector,contact switch,contactless switch, level pulse;Input signal voltage: low level: -30V -0.6 V, high level: 4-30V. 5.Use:wind turbine,harvester and motorcycle..
1000 rpm / ~99999 RPM / min score: 1 RPM / min. 2.5 RPM / ~999.9 RPM / min score: 0.1 R / min. The laser power is high and low, and the two gears are adjustable. Power consumption: low laser power of about 25mA; high-end laser power of about 40mA. Rotation laser speed: 2,5 ÷ 9999,9 rpm. Reading: 0,1 (2,5 ÷ 999,9) rpm g. Reading: 1 (1000 ÷ 9999,9) rpm g. Surface speed: 0,1 ÷ 999,99 m / min. Rotation Speed Range: 100~40,000RPM. Low power symbol automatic indicating. °C and °F Temperature switch function. or testing one of cylinder rotate speed. Testing the rotate speed used to 2 stokes and 4 strokes. If you do not receive our reply within 48 hours, pls. If you are satisfied with our service, pls. <1,000RPM Coarse adjust: ±10RPM. 1 User Manual. LCD display with backlight for clear indication. Display: LCD Backlight Display. Item Size: Approx. 11.9 5.1 2.8cm / 4.7 2 1.1in. 117g / 4.1oz. 17.8 6.4 4cm / 7 2.5 1.6in. Item Weight: Approx. Resolution rate: 0.1(0.5~999.9), 1(1000~19999). - Unit: RPM. - Size: 55.0x33.0x157.8mm. - Power: Two 1.5 AAA batteries. - Accuracy rate: 0.05% 1. Low power symbol automatic indicating, yellow-green back light, °C and °F temperature switch function. If you do not receive our reply within 48 hours, pls. If you are satisfied with our service, pls.